I’ve previously written about holsters. 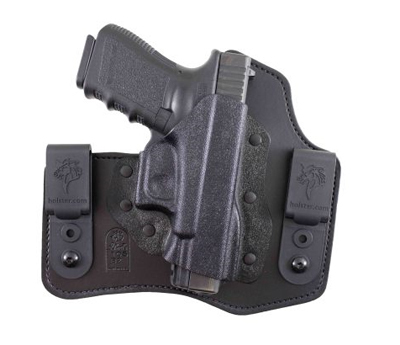 We get questions about holsters all the time, so we try to keep up with what’s out there. My experience in the past has been that I’ve not found any off-the-shelf holsters that really work for me. Every holster I’ve been able to use consistently and successfully has been custom ordered. My primary brand loyalty is to Crossbreed because that’s the holster I’ve worn for the past seven years 90 percent of the time. Almost every time I’ve tried something else, I’ve come back to the Crossbreed SuperTuck. The first exception I found to that was with an Alien Gear Holster. Alien Gear makes a really nice holster at about half the price of the Crossbreed. It’s not made from leather and Kydex but with a breathable Neoprene backing that is quite comfortable. I have a couple of Alien Gear holsters, one for my S&W M&P and one for my 1911 Commanders. I have had no issues with the Alien Gear. Great holster. Yesterday I found an off-the-shelf holster that actually works for me. I stopped by Fort Worth Gun to pick up some hearing protection and while walking down the holster aisle, not really browsing, but casually scanning the shelf, a holster caught my eye because it was very similar to the Inside the Waistband (IWB) holsters that work for me and there it was in a store. It wasn’t very expensive as holsters go, a little less than $60, so I thought I’d give it a try. I’ve been wearing for the better part of a day now with a Smith & Wesson 1911 in it and honestly don’t notice any difference from by Crossbreed or Alien Gear holsters. So there you have it. An off-the-shelf holster that I can recommend. This particular model for the 1911 will work fine for 4.25 inch or 5-inch guns and you can order one online at desantisholsters.com. It appears they have models to fit most of the common carry guns. Let’s talk about a different topic. I picked up a new gun magazine yesterday and just like almost every gun magazine I’ve seen in the past few years, the back cover had a beautiful color ad from Kimber. The particular gun they were pushing was a new .380 in a down-sized 1911 format. The tagline on the ad was, “light, compact, powerful.” To me that ad seems misleading. I get the light. I get the compact, but to call a .380 micro pistol “powerful” is a stretch. If .380s are so powerful, why don’t the police carry them? Why doesn’t the Army use them? Some years ago, law enforcement abandoned the .38 special in droves to move to semi-automatic handguns with more rounds and more powerful cartridges. Look at a .38 Special cartridge compared to a .380. The .380 is a lot smaller, isn’t it? Same diameter, yes, but lighter weight bullets and much less powder. They are NOT powerful. Well, more powerful than a .22, yes. But it sure beats me why ordinary citizens in droves are feeling very comfortable depending upon a caliber for personal defense that the professionals all deem inadequate. Next Next post: Magazines – Who Wouldn’t Want More Rounds?